Asked earlier this month whether she'd be indicted over her use of a private email server as secretary of state, Hillary Clinton responded: "It's not going to happen." WASHINGTON (AP) — Asked earlier this month whether she'd be indicted over her use of a private email server as secretary of state, Hillary Clinton responded: "It's not going to happen." 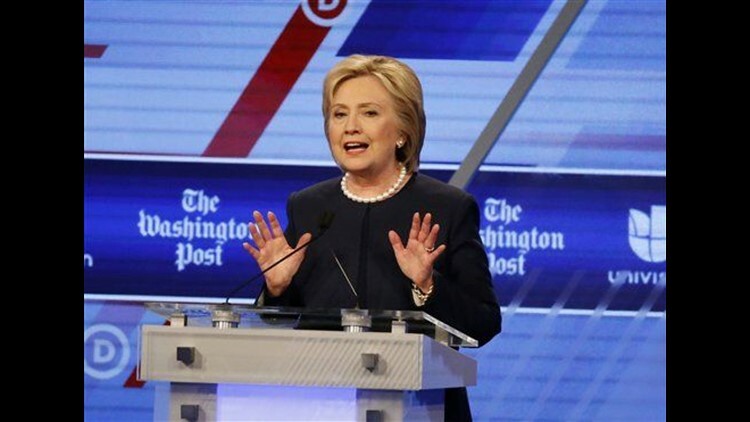 Though Republicans characterized her response as hubris, several legal experts interviewed by the Associated Press agreed with the front-runner for the Democratic presidential nomination. The relatively few laws that govern the handling of classified materials were generally written to cover spies, leakers and those who illegally retain such information, such as at home. Though the view is not unanimous, several lawyers who specialize in this area said it's a stretch to apply existing statutes to a former cabinet secretary whose communication of sensitive materials was with aides — not a national enemy. During her tenure as the nation's top diplomat between 2009 and 2013, Clinton's work emails were routed through a private computer server located in the basement of her New York home. The State Department now concedes that a small percentage of those messages contained sensitive national security information, including some later determined to be top secret. Computer security experts say the arrangement could have left the messages vulnerable to hackers, including those working for foreign intelligence agencies. Clinton has called her decision to rely on the home server a "mistake," but has also repeatedly asserted that none of the messages was marked as classified when she sent or received them. The FBI has for months been investigating whether the sensitive information that flowed through Clinton's email server was mishandled. The inspector general at the State Department has also been reviewing the issue. Regardless of the outcomes, there's no question the probes have created a major distraction as Clinton campaigns for her party's nomination. One potentially relevant statute carrying up to a year in prison makes it a crime to knowingly remove classified information and retain it at an unauthorized location. Former CIA Director David Petraeus pleaded guilty to that misdemeanor offense last year after providing eight black binders of classified information to his biographer. He was sentenced to two years' probation as part of a plea deal, and prosecutors made clear in that case that Petraeus knew he was turning over highly classified information. With Clinton, though, "I look at something which requires knowledge, and the first question I've got to ask is, 'How do they prove knowledge?'" said Bill Jeffress, a Washington criminal defense lawyer. While knowledge that information is classified is a critical component, it can likely still be established even in the absence of classification markings on the emails in question, said Nathan Sales, a Syracuse University law professor who used to work at the departments of Justice and Homeland Security and who thinks that the investigation raises important legal issues. "Sometimes information is so obviously sensitive that you can infer knowledge from the content," in which case the lack of markings may not matter for the purpose of establishing liability, Sales said. A separate law makes it a felony to handle national defense information with "gross negligence," by causing it to be removed from its proper place of custody or to be lost, stolen or destroyed. But that statute is part of the Espionage Act, a law used against former National Security Agency contractor Edward Snowden that's generally intended for people the government believes intended to harm U.S. national interests. Proving gross negligence requires showing an act was more than just a mistake. "One has to put this in perspective of what types of prosecutions have happened under the Espionage Act," said Jon Michaels, a national security law professor at UCLA. "And the universe of prosecutions under the Espionage Act is quite small compared to the amount of information transferred through non-secure means." Brad Moss, a Washington lawyer who deals regularly with security clearance matters, said the Justice Department could conceivably look to bring charges in the Clinton email case but prosecutors would have to decide if they "really want to take that gamble." Inquiries into mishandling of classified information generally end with a security clearance revocation rather than a criminal charge, he said. But Ronald Sievert, a former federal prosecutor and University of Texas adjunct law professor, said an argument could be made that Clinton's creation of a private email server amounted to gross negligence. Each prosecution of classified information cases has turned on different facts, making it hard to reliably predict outcomes, and the disparate punishments have frustrated efforts to draw meaningful parallels. Petraeus got probation for knowingly mishandling classified information while a former State Department employee, Stephen Kim, was sentenced to more than two years in prison for disclosing classified materials to a reporter. Kim's lawyer, Abbe Lowell, urged for Kim's release in light of what he said was a "profound double standard." The Clinton case indicates a "dysfunctional" system of overclassification, Lowell told AP. "One of the perpetual problems with the investigation or prosecution of so-called leaks cases about classified information is that the law doesn't recognize as a defense that the material should not have been classified in the first place," he said. Regardless of the legal question, if Clinton secures the Democratic presidential nomination she's certain to be dogged by the issue through the November election. "Ultimately, the real risk for the secretary might not be legal as much as it is political," Sales said.